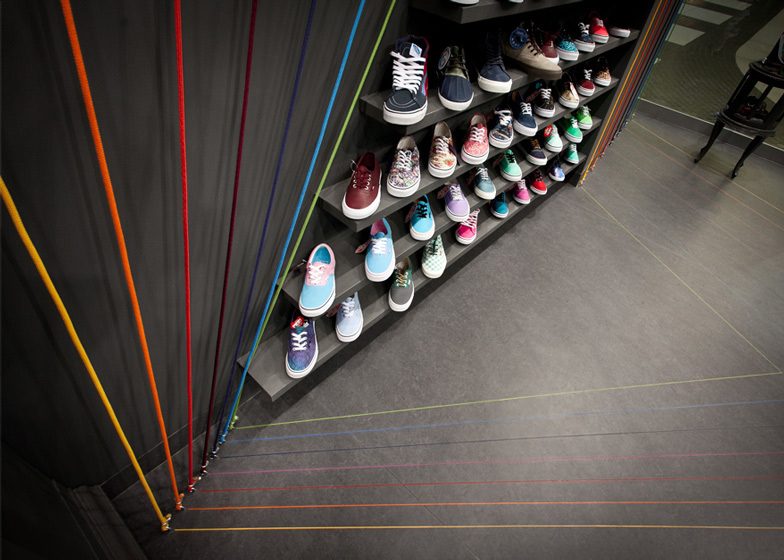 A rainbow of coloured cords streaks across this trainer shop in Poznań, Poland, by designers Mode:lina Architekci (+ slideshow). 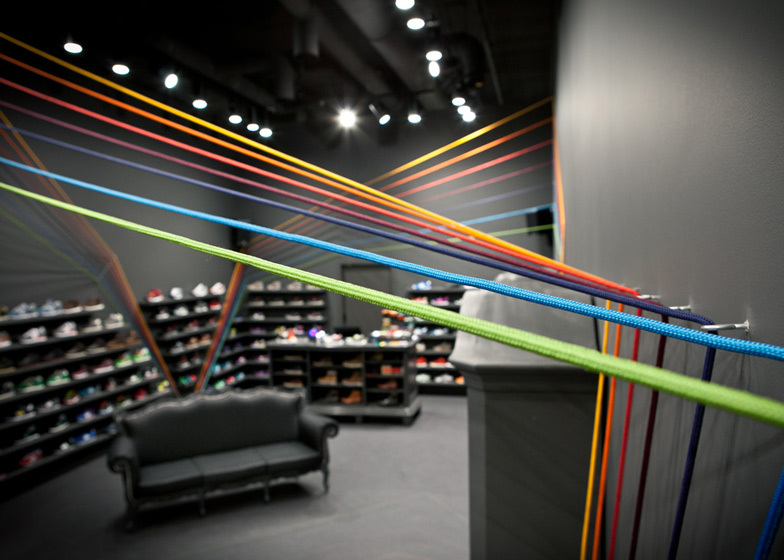 Mode:lina Architekci created the rope installation designed to look like colourful shoelaces for the Run Colours store. It contrasts with the dark grey interior and references the store's brand and logo. 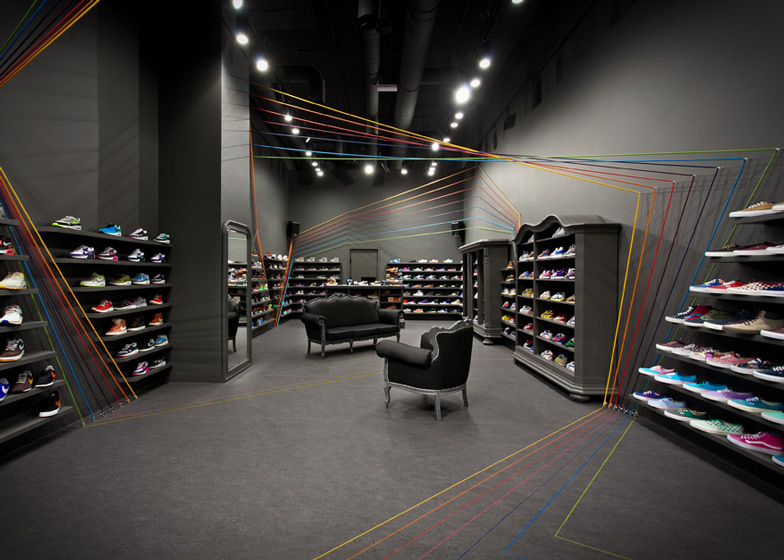 The ropes zig-zag through shelves of shoes on the walls and across the space in seven different colours. "Their prismatic shape refers to a fast movement of a runner," said the designers. "Colourful lines bounce from one wall to another also merging into floor space." The motif continues as a graphic on the floor while the rest of the store is furnished with antiques in the same shade of dark grey as the walls. The interior of the Poznań store was based on the original design of the first branch in Warsaw, created by the owners of the brand themselves in 2009. Photography is by Marcin Ratajczak. 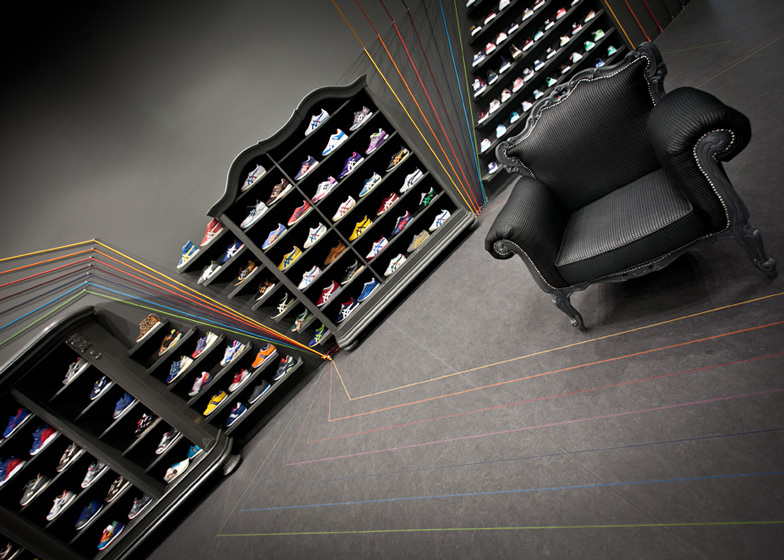 Encouraged by their succesful Warsaw-based store and internet store – owners of Run Colors decided to show their offer of limited series of Nike, Adidas, New Balance shoes to citizens of Poznań. 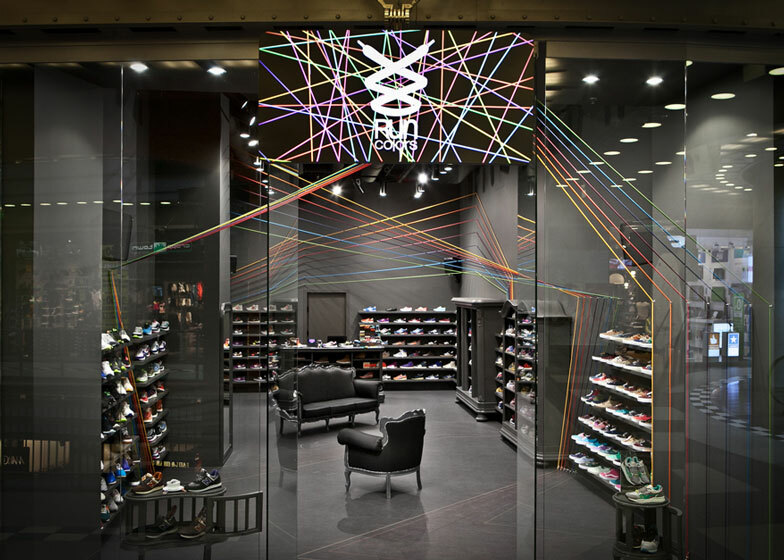 Designers created a concept for their new store in Stary Browar shopping centre as a space with strong connection to recognizable Run Colors name and logo – "running colors" theme. 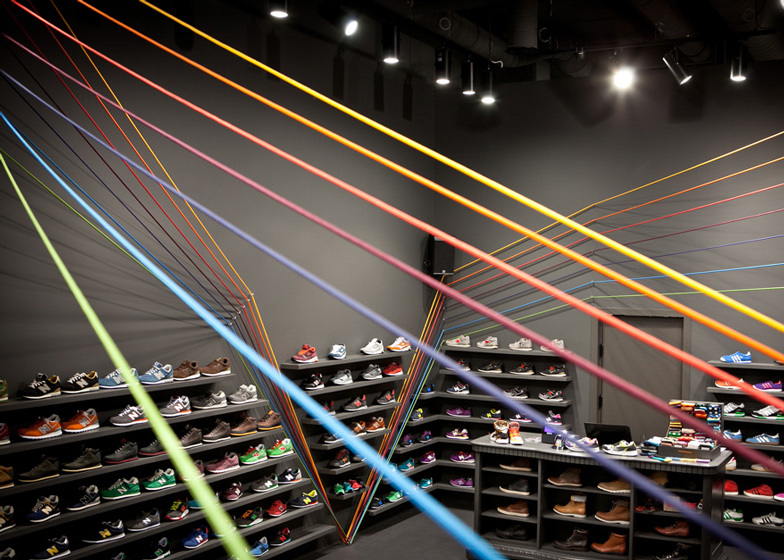 Shoelace – a feature distinctive for the brand - inspired mode:lina designers to create a dynamic and multicolour installation made of colorful ropes that remind of shoelaces. Their prismatic shape refers to a fast movement of a runner – colorful lines bounce from one wall to another also merging into floor space. 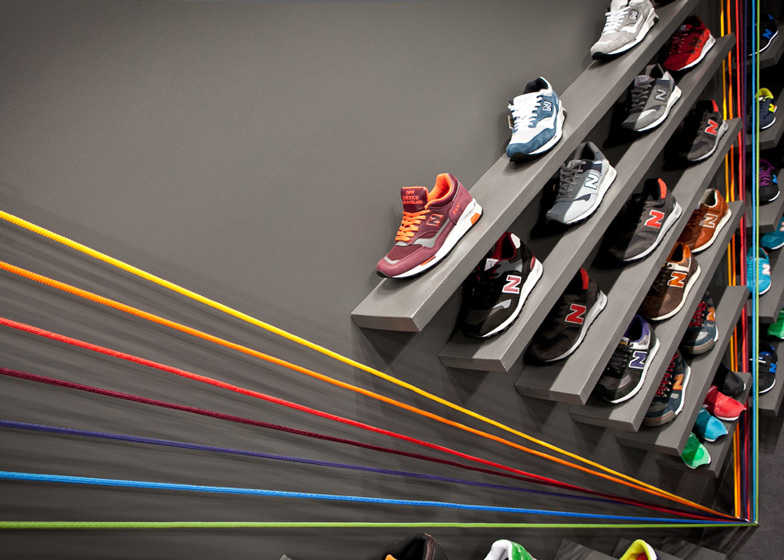 Dark grey walls make a great background for a wide range of shoes in different colours as well as coloful rope installation. Store interior is furnished with dark grey painted antiques – it is an echo of Warsaw-based shop. Massive old furniture with tiny colourful touches makes a good counterpoint for light rope installation.